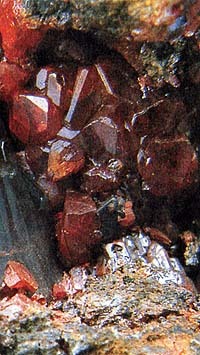 The crystals of realgar meet enough often, have a prismatic type, with shading on lengthening. More frequent mineral forms crusts or grainy the masses. In a fresh kind transparent thin. Colors here intensively red or orange-red. A line on porous porcelain is yellow-orange. Glance (glitter, glare) varies from resin to fat. Very soft and enough heavy. Cleavage distinct, but not perfect absolute. Fracture, break padman; mineral can be platy. Chemical composition (chemistry, compound). Arsenic, arsenium (As) 70,1%, 29,9% is grey (S) with an orpiment. form of crystals. Mainly short-prismatic crystals. Class of symmetry. Prismatic-2/m. Cleavage. Perfect to on (010), (210). Aggregates. Dense, short-grained, downlow. 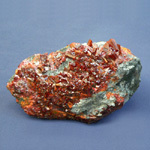 A rare orange-red soft mineral consisting of arsenic sulphide in monoclinic crystalline form. It occurs in Utah and Romania and as a deposit from hot springs. It is an important ore of arsenic and is also used as a pigment. As a result of the protracted stay on easily collapses light of Realgar, transforming in orange-yellow, gold powder, which consists mainly of very poisonous arsenolite, and also orpiment and pararealgar. Easily melt fuse and evaporates (publishing the smell of garlic), red sublimate appears in a retort. Dissolves in aqua regis (chloroazotic acid) with a selection sulphur, brimstone. 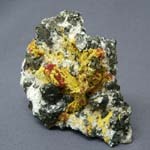 It is mainly in low temperature hydrothermal vein, lode, mines, associating with the sulfides of arsenic and antimony. Also can appear at a volcanic sublimation, in fumarole. 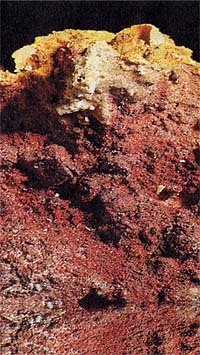 In addition, Realgar is formed near-by thermal springs. Finally, it is in some siltages (dolomites, rhumss). 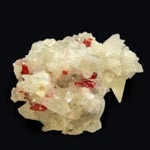 Mainly be found in low temperature hydrothermal vein, lode, mines, sputnik satellite - Orpiment, Golden Earth and Antimonite; rarer - as a product of volcanic sublimation among solfataras and selection from thermal springs. 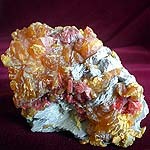 This mineral is known in the different districts of Italy. The best crystals take a place from the famous deposit of Lengenbakh, Valle-di-Binn, Valleze (Switzerland). 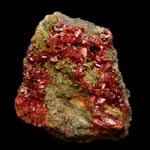 Realgar is used for the receipt preparation of metallic arsenic and his different compounds. In the past in mixture with saltpetre he was applied for the receipt preparation of artificial fires in pyrotechnics.